Pig-hog, wilt though be mine? Just saying, because it's not all about food, even though these are destined to become that. Being on a biodynamic farm means that life, while they have it, is good - particularly when Signs takes it upon herself to sing to them. See how they love me? I am in good voice because I have re-joined the local choral society in time for the Christmas concert. I have always liked this song about the lady who fell romantically in love with a pig. I delivered it to the best of my ability. And in it thou shalt lie. I have a feeling that they caught the pathos embedded in the lines and the melody, though the element of humour will have passed them by. Animals are capable of much more than we give them credit for, but they have no sense of humour. So I delivered it straight. That thou mayest go out and in. And why should the lady not love a swine? Stranger things have happened and romantic love, as we know, is anarchic and rarely sensible. It has laid low many a prince and princess, and one is lucky to emerge unscathed. Speak, or my heart will break. There was no possibility of a happy ending for the lady, though she probably (one imagines) went on to make a good marriage and settle down, even if the ghost of a Hooch! sometimes echoed in her dreams. My affection for the pigs is of a more robust kind. After singing, I went on my way and had a steak and kidney pie with a side of cole slaw in the farm cafe (yes, still on the cafe trail). Then I visited my sheep friends. Guess which one most took my fancy. that love was waiting somewhere. The leaves are nearly all blown from my next-neighbour-but-one's giant ash tree. How did that happen? I looked up from my notebook and there they were, the bare branches. Last time I looked they were full of green and red. A couple of writing buddies came over. Candles were lit, coffee and fruit tea made, buckwheat crackers (yes) on the table. But recent events and yesterday's activities (workshopping and choir practice) have sucked the marrow from my bones. No inner substance, no writing, not even dishwater writing - the kind you pull the plug on when it's done. I left buddies to their notebooks and mugs of fruit tea and went upstairs to the living room and looked at the sky, which was grey and unforgiving, but still, looking at the sky, and tree tops is something I need to do to replenish substance. Rooftops are also good. I have made more soup, sweet potato and lentil this time, some of which will soon be going to mater and co where it will either be eaten or left in the fridge until it has gone past its eat-by and thrown away. You will be wondering how it is that I had the wherewithal to make soup, in the light of what I have said about substance. But soup is like that - you can make it, literally, with almost nothing, a few bones, an old carrot, a handful of beans - and you can make it when you feel innerly without substance. The mater knows this, or used to. Her own grandmother made soup, she said, by singing into a pot. Sometimes I don't even sing. But the pot fills anyway. Look, it is autumn here on the edge, and look, it did not rain yesterday. So Mr. Signs took this photograph as evidence, and because he has an iPhone and I don't. The only reason I want an iPhone is for the photograph-taking. This path is near a biodynamic farm with a hut that serves up pies, pastries, coffee and soup, even on a Sunday. We had onion soup with hunks of bread and bought greens and salad from the vegetable stall. I had an apple from one of the crates harvested from the orchards. The rest will be pressed and made into juice which we will be able to buy (at some cost) from the farm shop. We spent time communing with the pigs. A particularly good-looking one came and eyeballed me. One day he might be in a sausage I cook in my frying pan. It is for this kind of reason that I tried to be a vegetarian and would have continued if it hadn't become obvious that doing so was making my precarious health worse. We have been talking about the difficulties involved in continuing to live in Signs Cottage, and where we should live when the time comes to sell it. To find the right place it would be easiest to move somewhere else. I carry the forest as part of my inner landscape. I don't need to be near it to do that. But I would still be homesick. Still on the cafe crawl, I had my first Stumpy yesterday, this being something similar to a Flat White, or at any rate a double espresso with same quantity of steamed milk. 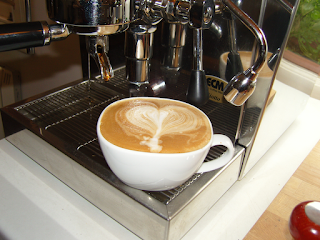 It came with a neater white froth heart than the one in the image (nicked) above and it was more or less perfect. The flat white has spoiled me for the latte which I now find insipid. To the obvious fact that caffeine is bad for me, I throw my hands in the air - let god and the angels sort that one out, and cigarettes and chocolate too while they are at it. Someone (where has he got to?) once tried to convince me that cigarettes were so good for you, Jesus Christ himself used to smoke them, though I don't think there is any actual biblical evidence for this. Still, it is a nice thought. Now if we can add to this the image of Jesus Christ with something approximating to a flat white then I will be happy. I am off to deliver watercress soup to the mater, the last batch of soup not having been given the thumbprint of approval by her spousian companion. Such is life. Pass the Nicorette. I am aware that it begins to seem as though I spend my life swanning from one cafe to another. Good, because what I am actually doing most of the time is negotiating paralysingly difficult circumstances surrounding the mater's recent operation and the aftermath thereof. I would rather live in what seems, and this out-to-lunch moment with the daughter in a local cafe so cool it would not be out of place in trendy Broadway Market fits the bill nicely. Yes, life is a bowl of perfectly-sizzled hand-cut chips, and a bacon burger with "onion marmalade" on a wooden block. If burger-on-the-block conjures up unsavoury resonances let us push them aside. Well, that was yesterday. And today I went to another place - the community centre cafe which operates three days a week from the old village school. The people that go there are mainly old, infirm or with small child, the cooks and waiters are volunteers and the food is best of 1950s and cheap. The cafe is held in what used to be the school assembly hall - all they have done is put a kitchen at one end and get tables and chairs. On the wall facing the large windows there is a mural, a collective effort by many children, called Our Village. There are bookcases full of paperbacks to buy for 10p and small glass vases with little fresh flowers on each table. It is one of my favourite places and if I get to heaven any time soon I will organise a welcome party for the volunteers, when their time comes. Up the Smoke last night to see the son gigging with The Blondettes (a band he started up pre Ed Fest, now going strong) and also playing cello alongside The Massive Violins. Fabulous. Sheer uplift. They were playing in a cellar underneath a Hackney pub. Before the show we looked for somewhere to eat in Hackney Road and found a cafe that did a passable shepherd's pie. Smother something like this in Bisto gravy and you can't go far wrong. Anyway, we chose it over the place across the road as Mr. Signs reckoned that anywhere serving both pizza and doner kebabs should be avoided, and I didn't care as long as I ate soon and avoided a blood sugar crash. If you click you might see the ghost of me in the window. They had a list of Baverages (yes I know, but that is how they spelled it so no point in arguing). I had tea. As we left I had a notion that there was something Hopperesque about this. The light isn't quite right, but the lone man there is - and the shadow. I've actually added a couple of new labels. Ever the optimist, I want more of both. So there we were, it being Friday, eating our fish and chips. From the photo, it looks as though there are not many people about, but the tiny place was packed, not just with people sitting but queues of folk waiting for their takeaways and I would lay a bet that not many of those were practising Roman Catholics. But fish on Fridays is somewhere to go, isn't it - somewhere to locate ourselves in these Godless and, some might say, God-forsaken times. Like pancakes on Shrove Tuesday, chocolate eggs at Easter, Turkey at Christmas, it gives a kind of rhythm to the weeks and months and the ancient hearth is, if not exactly renewed, then at least not entirely lost. We feel it somewhere in the body of us. The fish bar is not anywhere near a harbour, but that doesn't matter. There is a drawing of fishing boats on the menu, we know that fish come from the sea and we can imagine ourselves near it, salt spray in the air and the mew of a seagull. The mater and her new half-hip are back at home with zimmer frame, walking sticks and codeine for pain relief. Old age, rather like M.E., isn't for wimps, and until now the mater has been sprightly with weekly Pilates, acqua aerobics and constantly moving about. Unsurprisingly, she doesn't like this state of affairs. In the fish bar Mr. Signs and I got to talking about how it would be when we are nearly ninety. He reckoned that by then he would be long dead as his parents didn't make it beyond eighty. I reckoned that I ought to be dead before him because M.E. does do that to a life - shorten it, I mean. But because it has taken so much of the living I would like to have done, I feel I am owed something in the way of payback time so don't accept that I won't make ninety and beyond, whatever the statistics. When the great big ship with the black sails comes in, will we be standing at the harbour meekly waiting to be taken? I suppose that is the best way to go - gently into that good night. But right now I can't see it. that the living it is hard, oh but it suits me well. Though truth to tell (mine) I want for the living to be easy sometimes, the years to keep on turning, with pancakes in their season, chestnuts roasting on an open fire, a bit of singing and dancing - fish and chips on a Friday. I have been spending the day recovering from activity the day before. This is one of the boring facts about life with moderate M.E. If you do something one day then you have to leave a space the day before and after or risk relapse. I occupied myself with fretting about Mater-related issues and trying to get hold of someone at the hospital who could give me an idea of when she might be expected to go leave. This, after Mater telling me on the phone that things were awful and she was desperate to to home. No-one was answering the phone on her ward though I tried at intervals throughout the day. Eventually the hospital receptionist, fed up of hearing my voice, put me through to another department "so you can make a complaint." A diplomat to the core, I always make myself sound as grateful and stupid as possible so as not to be though a trouble-maker. The complaints department arranged for someone on the ward to call me back - she was super-friendly, didn't have a clue what was going on and then neglected to press the 'end call' button so my phone was out of use for a good hour while I used my mobile to try and find the person who made the call so I could at least go back to square one. Plan for tomorrow: go to hospital, get low-down on the situation and connect with hospital social worker. Also, get organic vegetables and take vegetable soup in a thermos to Mater, who is not eating the hospital food. I feel as though I am going down with flu. This would be worrying in the circumstances, were it not for the fact that this does not necessarily mean it will manifest as such. It's an M.E. thing. But on the other hand, flu has been known to happen and the last thing needed is for Mater to be infected with a virus. Mr. Signs came back from London feeling low and things were a bit bleak at Signs Cottage, so we ate the best part of half a barm brack, toasted, with butter And then my friend Cake Lady came round with a tub containing a huge quantity orange and walnut crumb cake. I've just had a piece, with a glass of milk. I know it's generally thought that love is all you need. But sometimes you just need cake as well. I don't know how or why I ended up reading something about how to write the perfect blog post, it isn't as though I even aspire to writing the perfect post. I only ever began it for the craic and the curiosity when I was having (what I though would be) a gap year out from teaching. I knew I could only do this thing if I allowed myself free rein to speak about whatever happened to come up at any given moment, and that often the whatever would very likely be about writing or M.E. I had never heard the word Monetise. I didn't consider that blogging might be a useful way of promoting oneself if one had something to promote - though I quickly saw that this was what some people did. As I had nothing to declare but my genius, or lack of it, it seemed ok to just carry on as per. But anyway, it seems that what you have to do if you want to be a Successful blogger is first think of a topic. You should make it a large enough topic to justify several posts. You should also write lists, set targets, write a post a day, do an introduction, interlink your posts - and many other things it gives me a headache to think about. My topic for the day or rather, for this very moment that I find myself in, is that sometimes there is no topic, or at any rate none that one would care to identify. The mater has just had a partial hip replacement, but this is not a topic, nor are the circumstances around it up for discussion. Things are difficult. On account of the above (list ahoy! ), I have missed my Lewes poetry workshop, not written as much of the things I planned to write as I would have liked, eaten quantities of sweets, had insomnia, tried to suppress the onset of old but familiar neuro-symptoms with drugs, decided that I can't go on living like this, remembered that I often decide this and life goes on. Targets. You will remember that on 24th September the plan was to put up a post a day until Christmas. If you are a frequent visitor you will not be surprised that the plan has slipped a little. Targets and me don't sit well together, and if there is fault to be found then it is with the notion of Targets, not with me because I do my best and then make adjustments whereas Targets just sit there looking cold and reproachful. So bugger targets. I know the author of the how to write perfect blog posts was not speaking about this kind of target. Just saying. I am sure I had something else to say. But what is emerging at this very moment is that I am too tired to set it down or even remember what it is. I have just eaten a packet of Monster Munch and am suddenly thinking about the woman with selective eating disorder who eats nothing else, and the six-year-old girl whose mother left her alone in the house for five days with nothing to eat but packets of those. Both survived and survive, though obviously it isn't food. The young girl's case was clearly one of child-neglect, but the other is a grown woman who seems to suffer no major ill-effects. We do not live by bread alone but by every word that proceeds from the mouth of god, so it is written. Perhaps the woman's faith is very strong or she has another source from which to draw the vital forces one needs in order to live. I have a healthy diet with organic vegetables, fruit, meat, whole grains and pulses. But the woman who only eats Monster Munch is stronger and possibly healthier than I am. All she suffers is brittle nails. Some things are just mysterious and one accepts this. Last night was the first Halloween for many years that we did not put a carved pumpkin on the hedge to show itinerant vampires, ghouls and witches that they could come and knock for sweets. I know this is one of the winter shine-your-light-in-the-darkness festivals, but actually, I should have medals for doing this for, well - much of my life, really. Last night the wick had burned down to almost nothing. It revived a bit after the good words of a friend (we do not live by bread alone), chocolate and prescription drugs - good things all three, and I do not despise them. And now it is that time of year again and I am back in the frolick and fun that is NaNoWriMo. In my fashion. One year I nearly killed myself with word-count frenzy, another I came down with swine flu and really, a diet of a thousand words a day is respectable enough in my yet-to-be-written book. So I will be embracing the spirit of NaNo without the caffeine overload or sleepless nights which, actually, I already have. It is also the Daughter's birthday. This, and the fact of her existence, makes me very happy.